Digital meters are different to other meters. There are a range of different meters currently in use, some with an electronic display. However this is no indication of whether they are digital or not. For a meter to be considered digital it needs to measure usage in half-hour periods. If you have 3G or 4G mobile coverage, it will send your encrypted usage data via the network to be collated and put on your bill. In areas without sufficient 3G or 4G mobile coverage, a meter reader will need to access your meter to collect your usage data manually. All electricity meters, including basic and digital, must operate within extremely strict standards for accuracy and information security. 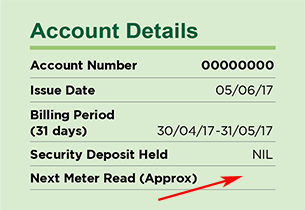 On your bills, you’ll see there's no ‘next meter read’ date as your bill is issued each month based on your usage data, not a manual meter read. There’s also no ‘previous’ and ‘current’ readings, as digital meters don’t work that way. They measure usage, which is collated for the month and put on your bill.